Sometime late last year, Nokia launched the three new devices in the new Asha range, the Asha 500, Asha 502 and Asha 503. These were basically a followup of the previously announced Asha 501 which was to define a new turn where Nokia blended Series 40 Operating system for the Nokia feature phones with Smarterphone, an Operating System Nokia acquired earlier to bring smartphone like features to the entry level device. To cut the marketing jargon that Nokia would use, it was to try and fend off the war that Android had already waged at the bottom of the pyramid where it actually does matter for Nokia. The three devices were launched together with an OS revamp that saw Nokia Asha phones able to do more than just swipe and get twitter notifications on the feature Nokia lovingly terms as FastLane. Fastlane is a harmonized “notification center” that Nokia uses for the Asha Platform devices. It’s just a swipe away, most things on the Asha actually are. What new things does the new Asha Platform bring? Fastlane usually acts as a hub for all activity on the Asha phone, you get a list of recently opened apps, user activity like notifications, calendar entries and reminders. Basically Fastlane is Nokia’s attempt at making the OS better integrate with the apps installed, mostly the social apps. This makes it easier to keep tabs on what’s happening around you as you access the apps by tapping on the Fastlane notifications. The Asha Platform also brings with it WhatsApp, one very popular messaging app. Nokia was previously silent about it when first Asha Platform device was launched as it doesn’t really feel good to launch without some very important things people use on the daily. Nokia also put in some work in the design sector, you remember the Dual-shot technology they put into the Lumia 620 where the back cover (which is essentially the colour definer) has two colours, bringing out some glossy bright look? Well they brought the same technology down to the Asha phones, the three of them sport the Ice look that is brought about by the Dual-shot technology. Two colours are blended together on the cover, for the Asha’s case, the outer case is clear, making it look icey. 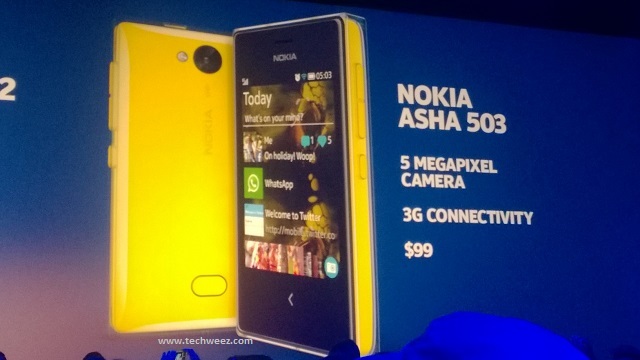 Asha 503 which is Nokia’s first 3.5G Asha Platform device will sell at Kshs 10,500 while the Asha 502 will sell at Kshs 9,700. The Asha 500 on the other hand will retail at Kshs 7,600. Both the Asha 500 and Asha 502 will be available in the Dual-SIM versions unlike the Asha 503 which will be the single SIM device. Nokia have some serious brand recognition and loyalty around here but I doubt that they will be able to get very far with this batch, not with players like orange+alcatel offering a more capable [ 3G, etc ] android smartphone for less!